Infantile diseases take on novel forms in the tropics. 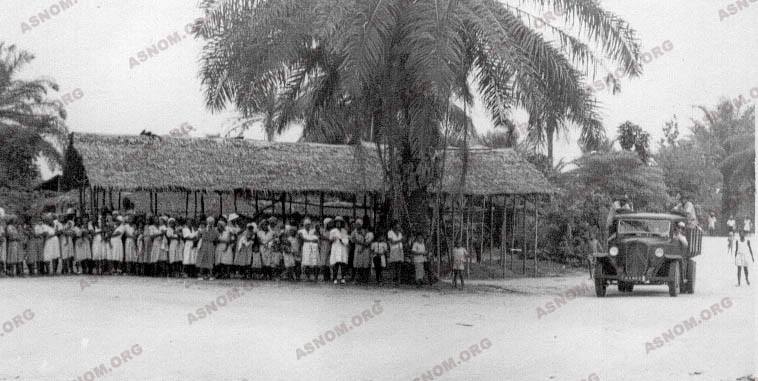 The Colonial Health Service has played an important role in their identification and prevention. The two great causes of mortality are infectious and deficiency diseases, often associated. The other paediatric illnesses do not distinguish themselves particularly, except for haemoglobinaemia, genetic anomalies peculiar to an ethnic group, responsible for serious anaemia and the death of African and Asian children. The risk of infection originates in cosmopolitan illnesses, among which diarrhoea and measles are the most lethal. Children are not spared by any of the tropical endemic diseases. Malaria takes a particularly heavy toll. The inadequacy or errors in the supply of food are, in the most underprivileged sections of the overseas population, the cause of deficiency diseases among which the most serious are protein malnutrition (or Kwashiorkor) and anaemia due to nutritional deficiencies. Giordani*, in an exhaustive report on conditions in all the French colonies, mentions "the most common children's diseases" : in the case of the under-fives, whatever the continent, the most usual consultations are for lung troubles (to which the child's nakedness contributes), digestive problems (diarrhoea and intestinal parasitosis). Just as cosmopolitan are the diseases labelled "Children's", whether they are eruptive like measles and chickenpox or non-eruptive like the mumps, poliomyelitis or whooping cough. Tetanus is frequent : tetanus in the new-born, due to the ligature of the umbilical cord by a soiled binding; tetanus in children, which has attained them through various orifices: wounds, chronic ear infections, ritual scars or the simple implantation of a jewel in the skin. Most of these diseases started to decrease as soon as vaccines were available and, from the seventies, when the OMS launched the programme of wide-spread vaccination.
) predisposes the infant to contracting the common diarrhoea due to starch. If, in addition, an infectious microbe, viral or parasitic, gets in, most often introduced by the pollution in water and salts, the symptoms become more alarming and may end up in gastroenteritis with vomiting. This leads to a greater loss of water and salts; severe dehydration results in toxicosis, a serious condition, one of the most common causes of infantile mortality in tropical countries. Re-hydration is the first therapeutic measure that must be taken in these circumstances. To begin with, oral feeding is the only method adopted, with the knowledge that the water available becomes drinkable only after boiling for 15 minutes. Water in which rice has been boiled is often used. In dispensaries and hospitals, salted serum, obtainable at the well-stocked pharmacy, is injected into the skin of the stomach. In the nineteen fifties, transfers through the tibia as well as the collar bone and the skull were used. At the same time, solutions of better adapted compositions were proposed. Let us note, finally, that in the nineteen seventies, the OMS recommended that the prescription of perfusions be limited by using, as soon as possible, drinkable solutions made at request by dissolving in non-polluted water "packets of re-hydrating substances" (glucose, sodium and potassium salts) generally available in the dispensaries and PMI centres. Associated infectious agents must also be destroyed. Against bacteria, at the beginning, there is no efficient medicine and lactic bacilli (Lactéol) is prescribed together with other remedies. After the Second World War, sulfonomides with local effects, such as sulfaguanidine (Ganidan), arrive and they are incontestably efficacious. Finally, with antibiotics, powerful antibacterial means can be employed. Together with modern techniques for observing re-hydration, the prognosis of diarrhoea has been profoundly modified. - Malaria, undoubtedly the most mortal of the diseases, in Africa as well as in Indochina. When it doesn't kill, it is followed by major disorders : the child, afflicted with anaemia, loss of weight, hypotrophy of the liver and spleen, develops badly and offers no resistance to infectious diseases. - Non-venereal syphilis or treponaemiasis (béjel and pian). The contamination of the child occurs extremely precociously by contact with wounds or scratches of the skin with oozing lesions. 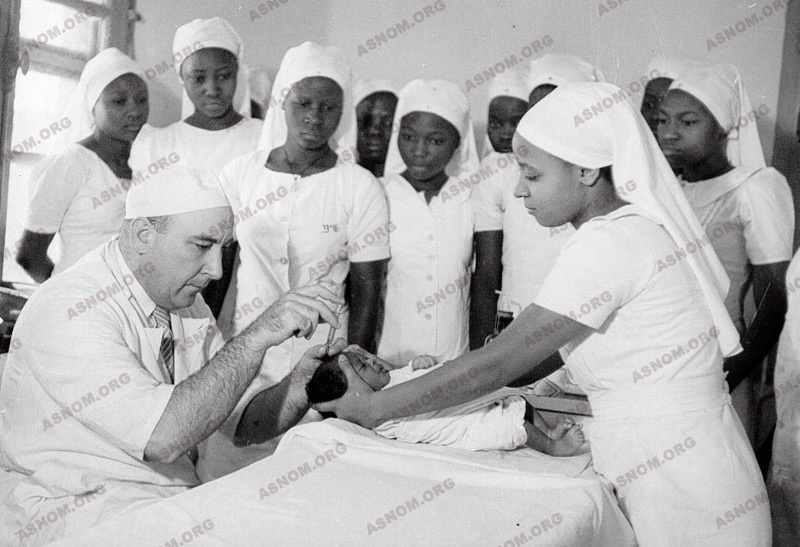 In certain parts of Africa, up to 1950, the seropositivity that indicates that a patient has experienced treponaemiasis infection is to be observed in practically 100 % of the women. 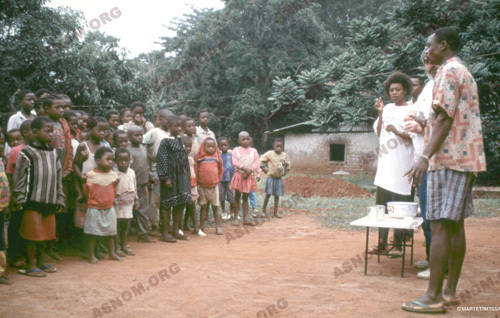 The mass campaigns of treatment started in 1955 by the services fighting the great endemics have practically eliminated the contagious clinical forms of the disease. - Tuberculosis in underprivileged circles. - Bilharziosis, vesicle or intestinal. - Leprosy doesn't spare children even if the disease becomes apparent only several years after contamination, by the time they are adults. 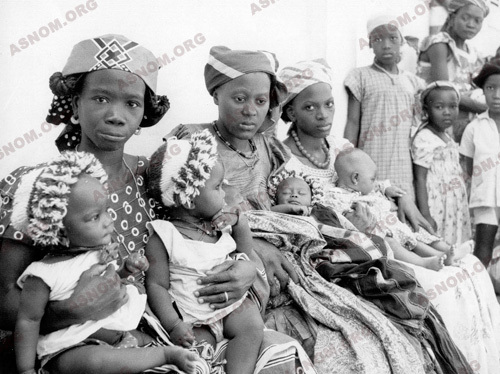 For example, in Senegal in 1960, one in seven lepers is less than seven years old. The disease evolving very slowly, the children grow up and found families, while bearing the lesions. The ascaris have a toxic and especially a mechanic effect, managing by their numbers to block the intestines or the gall-bladder. Many a surgeon of the Colonial Health Service, operating a child for a blocked intestine, has discovered a "ball" of hundreds of worms in a passage. The ankylostoma are even more noxious because, attaching themselves to the mucous membrane of the intestines, they consume blood (one-third of a millilitre for a worm each day). What results is severe anaemia (at least 50 worms in a child less than 15 years old, according to F. Blanc*), accompanied by a succession of oedema and problems of intellectual and somatic development. ". Lieurade eliminates a parasitic origin but doesn't find an explanation for "the red children of Cameroon". 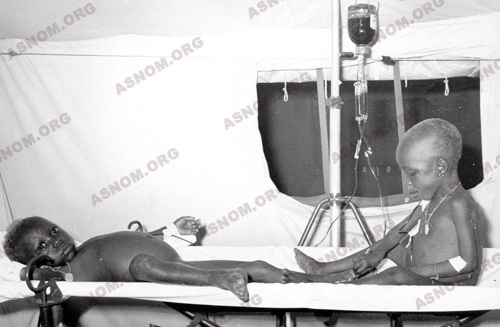 He has just made a perfect clinical description of a disease which, a few years later, is given a local name in Ghana, "Kwashiorkor" (red child) and whose cause is a deficiency in protein, induced by weaning. This deficiency is already referred to by Normet*, in 1925, in Indochina by observing children suffering from "boufissure d'Annam" ( "Annam puffiness"), described by Guillon* in 1913. The alimentary and multi-deficiency origins of these disorders is made clear by the missions in Africa (Brock* and Autret*) and those in Central America (Autret* and Béhar*). Raoult* and Bergeret* perfect the clinical and biochemical processes for the early detection of these cases of malnutrition. Rapidly put into practice, the appropriate treatment makes the mortality rate fall from 80 % to 20 %. The treatment consists essentially of re-establishing a sufficient supply of proteins; it stops being efficacious in advanced states of the disease. It is due to simultaneous deficiencies in several nutritional domains. In general, it is a question of deficiency in proteins, iron and the vitamins necessary for the maturation of red corpuscles: vitamin B12 and folic acid. It is often accompanied by parasitic anaemia. Toury*, in a West African rural zone, devotes many studies to this pathology and its prevention. All his investigations lead to the conclusion of the necessity of a large diversification of food intake. The results of his educational campaigns to promote good alimentation are very positive. - Badoual J. : Le kwashiorkor. Conc. Méd. 1975,97,14 2307-2317. - Centre international de l'enfance : Conditions de vie de l'enfant en milieu rural en Afrique. 1 vol. Paris 1968. - Centre international de l'enfance : Conditions de vie de l'enfant en milieu urbain en Afrique. 1 vol. Paris.1966. - Thomas J. Sagnet H. Chastel C. Le Vourch C. : Le kwashiorkor de famine (ou de guerre). Press. Méd. 1971,79,38,1681-1685.